We have waited a long time for some good news this week. After the joy of Saturday things reverted to normal pretty quickly. Poor Roxy was brought back to the SPA less than 24 hours after leaving, as was one of the puppies. On neither occasion was it the fault of the dog. For puppy, Dannie, it was no big deal, she was rehomed quickly (see below). But for Roxy it is a huge disappointment both for us and for him. As usual it takes us all some time to recover emotionally. Not only that, but the SPA had eight new arrivals yesterday. It really is never ending. However as well as this, two earlier arrivals were reclaimed, so it has not been all bad. The first adoptions of the week took place today. 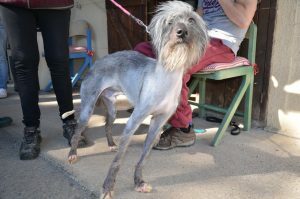 Marcel was brought to the SPA ten days ago, he had been found in the cellar of an empty flat where he had been left to die. Such is the world we live in. Unsurprisingly Marcel was very thin and very frail, but as soon as his photo was put on Facebook, he struck lucky. Mand much to everyone’s delight, he was spotted by a woman who was more than happy to make the long trek from Bordeaux to Carcassonne to come and take Marcel home. Massive thanks to Mathilde for her kindness towards this lovely old boy, who can now live out his days in peace. Another rather sad looking dog left too. 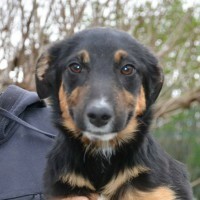 Volunteer Petra has offered a home to Denver. 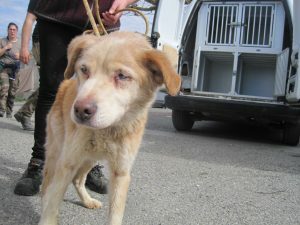 He is a 5 year old labrit who was found in a horrendous state by a woman walking her dog. Thank heavens she brought him to the SPA; otherwise this boy would surely have perished. Weighing jut 10kg on his arrival (less than half his expected body weight) Denver’s fur had all disappeared due to a mixture of severe malnutrition and parasites. Four weeks later and Denver is looking far better. But of course his fur needs to regrow and he needs to put on a lot more weight. His recovery will be far quicker in a loving home. And needless to say we will have regular photos of his development. 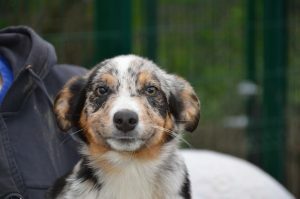 Today’s other adoptions are all of pups, including, as mentioned above, the lovely Dannie. Her sister, Nicole whom we all felt so sorry for on Saturday, has also found a wonderful home. The third pup to leave is from a different litter and these pups are also proving to be very popular. When you see Janis’s photo you will see why. But these are no lap dogs. Nicely feisty, as we would say! 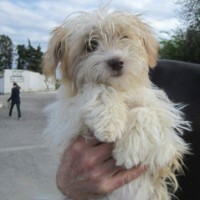 One of them, Joplin, looks just like a jack russell, which probably explains a lot! So it took a few days for the adoptions to start this week, but we got going today. We have an adoption scheduled tomorrow, but maybe there will be some other good news, too.